Six kayaks nestle snuggly above the covered aft deck. With a well oiled crew these can be over the side and people away within minutes. 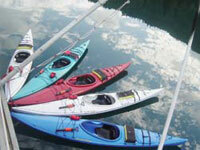 They're great kayaks - even the most experienced paddlers have enjoyed them. Made by "Current Designs" in Victoria B.C., the "Breeze" is 13.5 feet in length with a breadth of 25 inches. Made of roto-molded plastic, these boats are sturdy and stable yet still fast and maneuverable because of their short length. 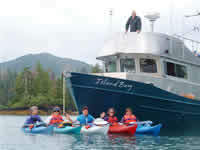 Perfect boats, in other words for short excursions in protected waters with paddlers of differing experience and skill levels. All kayaks come fully equipped with paddles (Nimbus Auk), spray skirts, pumps, paddle floats and personal floatation devices. If you have no previous paddling experience we strongly recommend taking one of many great kayaking courses offered in most urban and some rural locations. I've found that there's just not enough time in a six-day trip for serious kayak instruction. Even a day or two day introductory course prior to your trip will dramatically reduce the learning curve and allow you to more fully enjoy the natural splendor of the world around you. 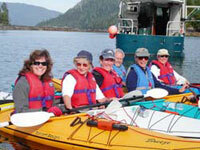 EcoMarine in Vancouver and Ocean River Sports and Vancouver Island Canoe & Kayak Centre in Victoria offer a range of kayaking courses. "When asked why I like paddling, I always come back to the simple act of dipping my paddle in the water and propelling myself forward by my own power. I love the balance of the double-bladed paddle, the energy and finesse of the blade. Breath by breath... stroke by stroke... powered by a desire to explore distant islands and experience the wonders of the sea. What could be better? Alan Wilson, editor of Wavelength Paddling Magazine on what paddling is all about.